Agio, which in Italian means "leisure", is the leading brand of upscale outdoor furniture. Its quality derives from trend-setting designs, enduring materials, state-of-the-art manufacturing processes and extraordinary responsiveness to the needs of consumers. Agio is committed to the design and production of the world's finest quality, high-value outdoor furniture. Through our commitment to excellence and our partnerships with esteemed retail customers, we're able to deliver levels of reliability and integrity rarely found in the industry. 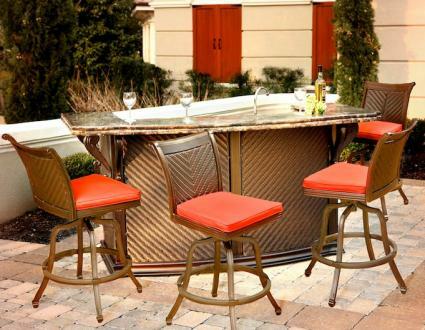 Bring leisure home with the Agio Party Bar Collection. A complete bar with working sink and small refrigerator. You bring the drinks, we will bring the comfort!